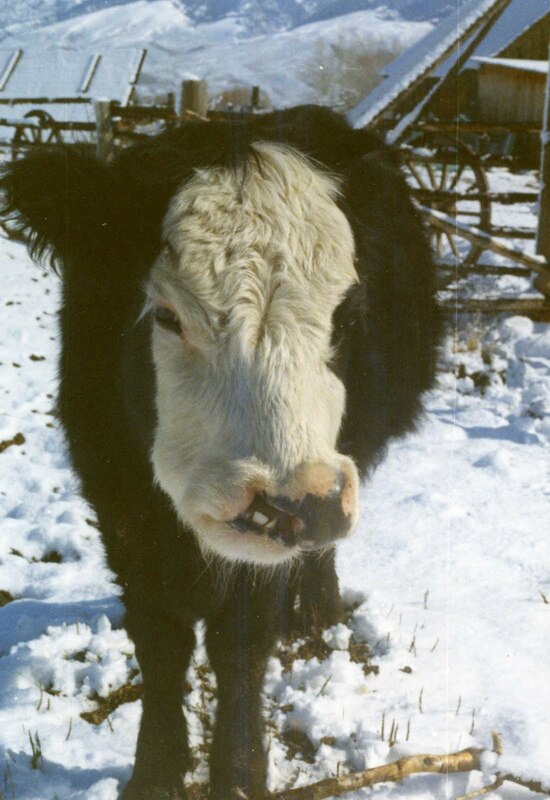 When Prue was born with a cleft palate in January 1973, we opted to try to raise her instead of “put her out of her misery.” By the time she was a yearling, she was such a pet that we decided to keep her as a cow instead of butcher her. She raised calves for us until she was nearly fifteen years old. She also served as a babysitter cow to lead heifers into the barn. For many years we calved in January, to be able to rebreed the cows in April to our own bulls, before they went to summer range (public pastures) in May. If the weather was really cold, we put the calving cows into a barn. Most of our cows liked to go into the barn to calve, but some of the young ones were timid if it was their first time. We always use an older gentle cow to show them the way, and they’ll always follow her into the barn. By the time Prue was three years old, we were using her to lead the heifers. She trusted us and never got excited, no matter how wild and upset the heifer might be. I could call her name and she would come. Then I’d let her into the calving pen with the heifer, open the gates, and Prue would head for the calving barn. We’d follow the heifer to make sure she kept up with Prue; the heifer would see Prue go into the barn, and with us right behind her, she’d follow Prue inside. Then we’d call Prue back out the door and lock the heifer in. Through her lifetime Prue led more than 350 heifers into the barn. But the summer she was five years old she nearly died. She became suddenly ill and didn’t come to the old barn with the two milk cows that morning. I searched the pasture and found her lying behind some bushes, trembling in pain. I ran to get a thermometer and took her temperature and discovered she was very cold even though the day was warm. I got her up and slowly led her to the corral and called our vet. He came to the ranch and examined her and told us she had a bruised rumen; it had stopped working, and no food was passing through. Probably one of our milk cows (maybe the one with a horn stub) hit her in the belly. If her rumen didn’t start working again soon, she would die. We gave her some laxative pills and poured a gallon of mineral oil into her stomach with a tube down her throat. She was very sick and miserable, so the kids and I spent several hours sitting with her in the corral, trying to comfort her and take her mind off her pain. She still hadn’t passed any manure by the next morning, and there were no stomach noises when I put my ear to her belly to listen. But she seemed a little perkier, with less pain. Our vet was going to do surgery if things didn’t start working, but since she was feeling better, we postponed surgery one more day in hopes the oil would get things moving through. Sure enough, the next morning there was a little pile of manure in her pen. I never thought I’d be so happy to see some cow manure! After that, she improved rapidly, and by the end of the week she was eating normally again. photosensitization: Here she is losing the unpigmented skin of her face. She had one other mishap a few years later, when she suffered from photosensitization — probably caused by eating a toxic plant that made her skin extra sensitive to sunlight. 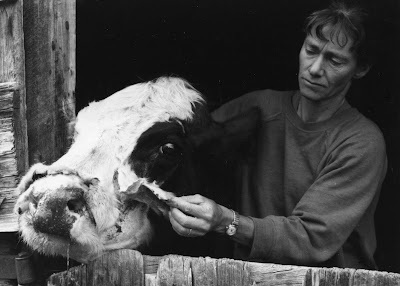 Her black skin was unaffected, being more protected from the sun’s ultraviolet rays, but the skin of her white face and udder became inflamed (worse than sunburn) and eventually sloughed off. We had to keep her in the barn out of the sun for several weeks and treat her with anti-inflammatory drugs. Her teats were so sore that she wouldn’t let her calf nurse, so we put a healing salve on them and had to supervise each nursing (to keep her from kicking the calf) until they healed. Prue's first calf was a little red heifer named Tivvy. Prue was always easy to work with, however, even when she was in pain, because she was such a trusting pet. She was more than a pet, though, and paid her way by raising good calves. Her first calf, when she was a two-year-old, was a red heifer named Tivvy, and her second calf was a big steer named Kester. 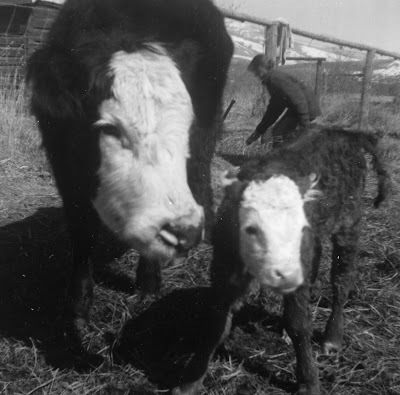 Over the years Prue had 12 calves of her own and also raised 5 orphans, suckling them along with her own calf, so she actually raised 17 calves — more than any other beef cow on our ranch. 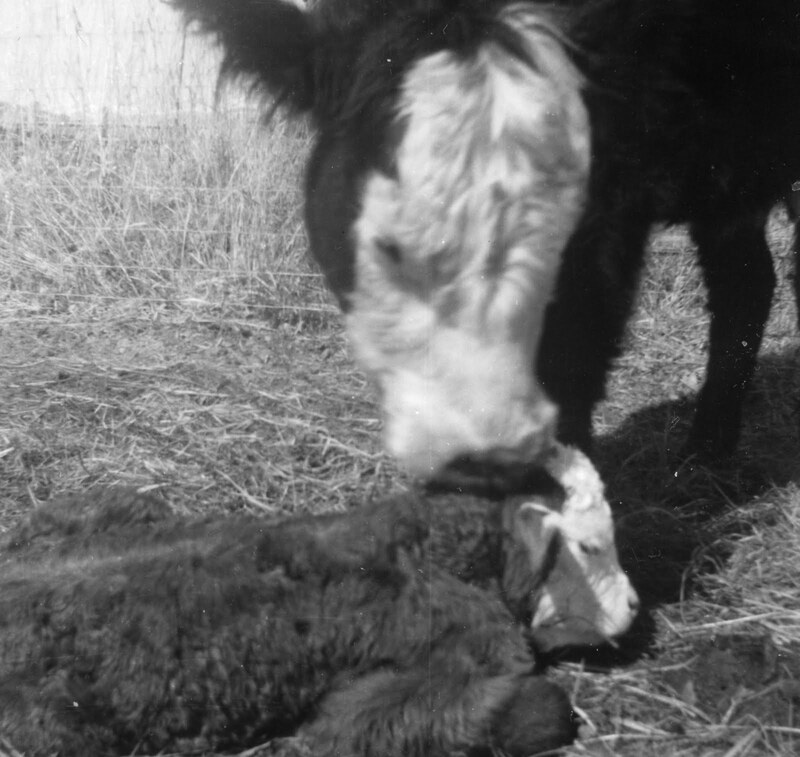 One year a young cow died a few days after calving, leaving a nice bull calf without a mama. Prue gave plenty of milk, so we talked her into raising two babies. Another year we had an old cow that was sick and dying of cancer a few weeks before she was ready to calve. We kept her alive as long as we could, then had our vet come take the calf out surgically and put the cow to sleep. The baby was three weeks premature and had to live in our kitchen a while until he was bigger and stronger; then Prue raised him along with her own. 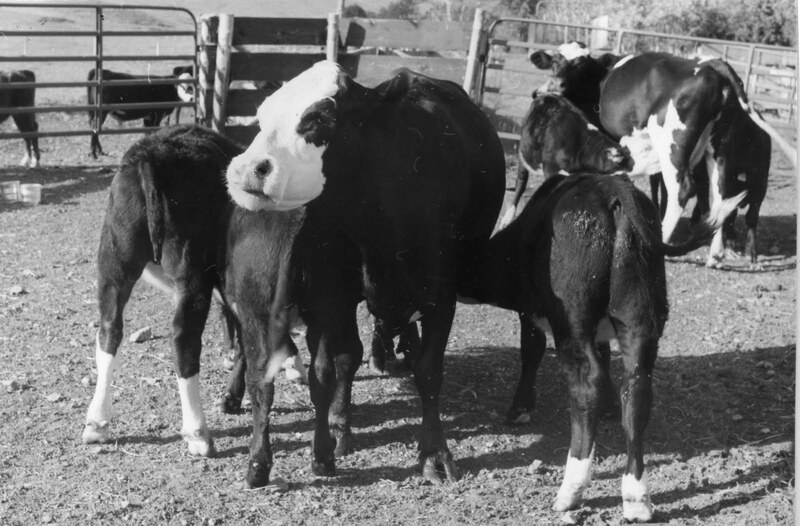 One year Prue raised three calves — Amos, Andy, and Squeaky. Another year she raised three calves. She started out with her own and an orphan — two steers that were about the same age — that we named Amos and Andy. A few months later we sold some old cows in the summer and weaned their calves early. We put the weaned calves with Prue’s boys and the milk cows’ calves so the gentle calves could teach the others to eat a little grain. 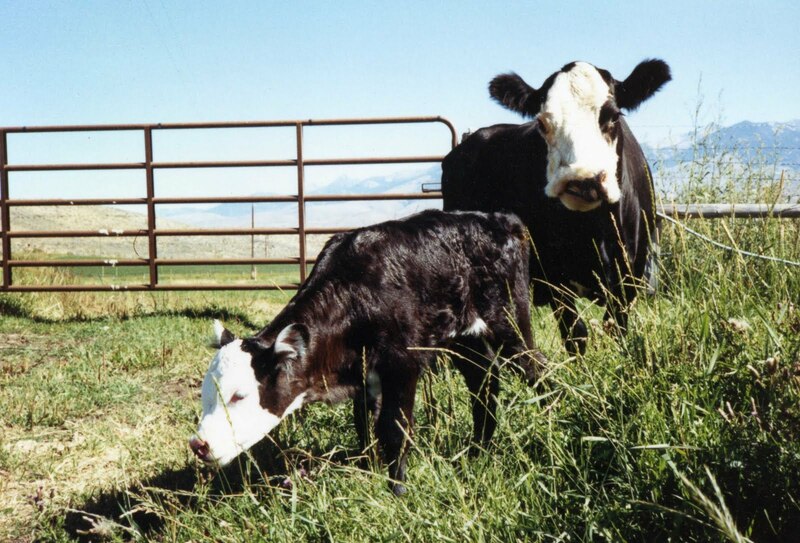 One of the youngest calves (just three months old) was so determined to have a mama that she started nursing Prue. Even though she was two months younger than Amos and Andy and much smaller, little Squeaky was aggressive and pushy and always got her share of the milk. Andrea named her Squeaky because she lost her voice bawling for her missing mama. She grew up fat and sassy, and our daughter Andrea traded one of her steers for Squeaky — who became her favorite cow. 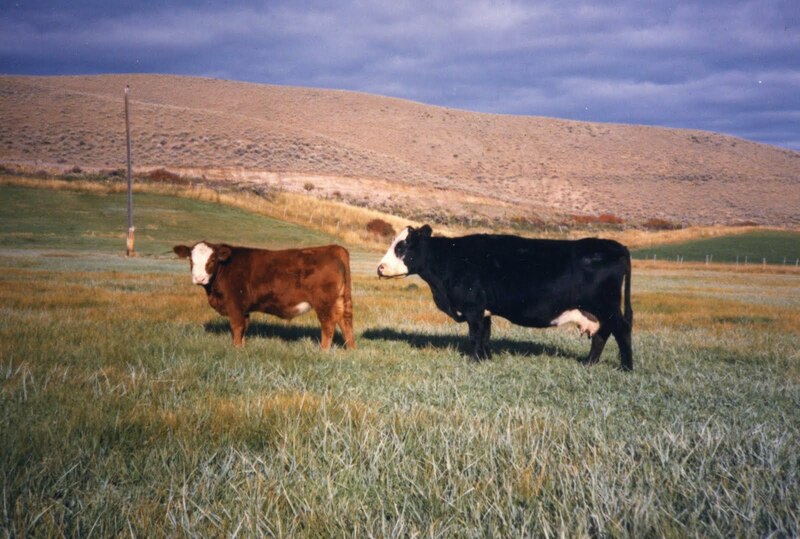 Prue's steers were always some of our biggest calves in the fall. Most of Prue’s calves were boys, and since she produced so much milk, her steer calves were always among the biggest calves that we sold in the fall. We did keep a few of her heifers, however. 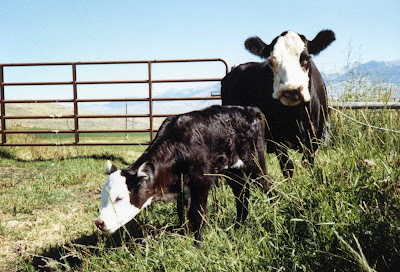 One year Prue had a big heifer that was so full of mischief and personality that we named her Appakeradokia, a Greek word that means “waiting on tiptoe in great anticipation.” We called her AppaKerrie for short, and when she grew up and had calves, Prue finally became a grandmother. Later, Prue had two more daughters that became cows, Prunella and Prunda Bear (who had black eyes like a panda bear), so she eventually had lots of grandchildren and great-grandchildren. Prue's last calf was born in summer, when she was fourteen years old. The summer she was fourteen, she started to show her age, calving later than usual; her last calf was born in summer rather than in January. After she finished raising that calf, we realized it was time for her to go. 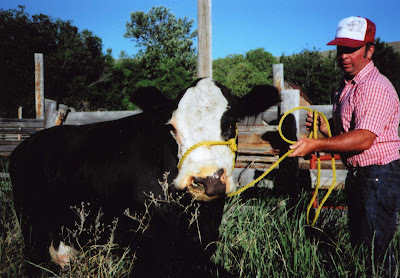 It was a sad day on our ranch that fall when Lynn led her down below the barn to humanely end her life; we opted to butcher her rather than send her to market with the other old cows, since the cattle buyers might not understand why she had such an abnormal face. Lynn holds Prue for her last photo; she's almost fifteen years old. She gave us a lot of good memories. Prue was one of the favorite “characters” on our ranch, all because we were willing to take a chance on a funny-looking calf that had a strong determination to live.